You are here: Home > MyTouch3G Fender Edition Delayed? 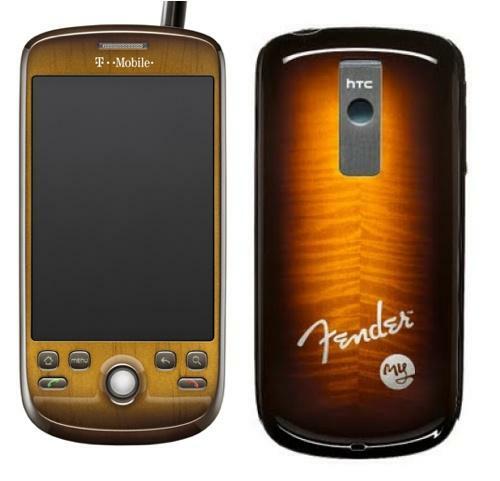 For those of you who were looking to combine serious customization and the purchase of a MyTouch3G, the Fender edition looked awesome. Unfortunately, word has hit my inbox regarding a possible delay in expected launch, scheduled for later this year. In fact, it looks as if this Wood Grained beauty won’t drop at all during the holiday season,and instead will be launching after the first of the year. Thankfully, you have still have White, Black and Merlot combined with a super selection of customization options still available to personalize your MyTouch to your heart’s content. Of course, you could always look at other Android options this holiday season. the only thing that interests me about this device is the extra ram. I hate it when my 1st gen mytouch gets bogged down. anyone know if this or any of the mytouch’s will be able to run Android 2.0? If not, is there word on the street as to when Tmo will release a phone that can? Meh, more of a Gibson Guy myself. Fender is overhyped. yeah….”other android options”……like the droid on verizon! Is this delay part of project flop?! What a joke….why’d they rush out such a disappointing offering. They should have took their time, and made an announcement that coincided with system upgrades (more 3g) and new sweet phones. Ugh!!!! I personally enjoy the myTouch3G merlot that I have. Having experienced it I think the Fender is extra nice so I will wait patiently for it. Beware most 16GB cards are Class 2. Not very desireable for Apps2SD. I really just want the case, and I’m working on a veneer cover for my G1. Hey, plagiarism is good, right? it will be released before xmass … guaranteed. Apps2sd may be a luxury for HTC devices, but Motorola may be SOL in that regard. Verizon has pretty much said that Droid is not been designed for easy alteration and people are bricking Cliqs when trying. N900 does not seem so expensive the more this stuff evolves. Maybe they can take the time to update it with something very important, like maybe a camera flash! What do you mean rtx? No more runway left for Tmo to launch a device for the holidays and Droid is a Verizon exclusive. Are you talking HD2? The Android version is Verizon’s as well. Hmmm. So do we have all the specs for the Behold II yet? Also, what price will it be offered at? It would seem like all other Android phones will have to take a price cut with the Droid being offered at $199. mytouch will be able to run android 2.0 just fine. It will launch on the droid but will be available to everyone else very quickly. remember android is an open source OS so it will never be on one exclusive device. Eclair enables Multitouch for Android. It probably won’t help with the speed but there is supposedly an improved touch keyboard in 2.0 as well. Really? I was holding out for christmas to get it. Not crazy about the look of it but I really want the extra RAM and the 3.5mm jack. Why the original mytouch wasn’t on the 32a platform still makes no sense to me. I think this version is hideous looking. I mean I guess if you like guitars I take it? then itd be ok for you, but anyone looking for a myTouch then I def wait for this version, throw a backplate on it, and a skin and your good to go, nobody will notice. I got a myTouch, but Im waiting for that G1v2 early next year!! Android 2.0 does not necessarily mean multi-touch. The droid units currently floating around do not support it. The Browser on my rooted G1 has mutlitouch. It was never a hardware issue, just software. Is there anything else we should expect from T-Mobile? I guess this is another of the unleaked features of Project Dark. Gotta agree, Maximus.. Delay after delay, getting shortchanged on RAM.. Then Verizon drops the Droid, which is 20 times better than anything us T-Mo suckers can get. Shoot, Android 2.0 hasn’t even come out for anything T-Mo. Maybe it’s getting time to make that switch. I don’t really want to, but the old adage “If you can’t/won’t do it, I’ll find someone who can/will” just might apply here.